It seems like every year there are more and more marathons and other walking or running events. This means that runners need to make the decision which of these races to participate in, and the events need to separate themselves from others to remain competitive. At Fire Up Video, we have one possible solution that we have been providing to marathons for the past seven years with great success. Since we started seven years ago, we have been providing Jumbotron screen rentals for marathons and races with nothing but positive feedback from race organizers. Our mobile LED screens add something special that most marathons don’t have, and guests absolutely love it. The big screen video wall keeps runners and spectators entertained, and makes every event seem larger than it already is. There are multiple ways to use these LED video screens at your race, but typically the most popular way for this kind of event is to use a live video as runners go by the screen so they can see themselves on the big screen. They love getting on the Jumbotron, and they always give a wave, a smile, or a loud cheer. 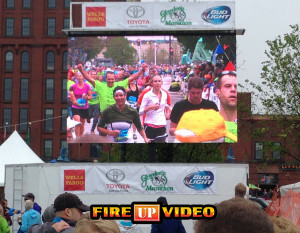 The chance to be on the giant TV screen gets the runners excited, and helps to improve their overall enjoyment of the event. The LED TV is also great because it gives spectators a better view of those they came to see. When the mobile screen is placed near the finish line with a live video feed sent to it, runners can see themselves on it, and it gives them the extra motivation to finish the race strong. At many races, we will start with our Jumbotron screen near the starting line to capture everyone running by, as well as any opening ceremonies. Once the runners have passed the starting line, we can easily move the screen to a new location, such as the finish line. It takes less than a half hour to tear down and set back up in a new location. We can also move the mobile screen to another area, such as an after-party or concert following the race. Other than a live video feed from the event, our screens can also display other footage at the event. If you have other races, events or organization information that you would like to promote, we can play that to your audience. You can also use the Jumbotron to give promotional time to your event sponsors, which will make them happy and likely to return in future years. Creating a sponsor loop video or other event information, combined with live video footage can really bring your race to the next level. Fire Up Video provide mobile big screen TV rentals for marathons and other racing events all over the Midwest. 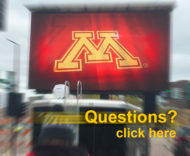 We bring our mobile Jumbotrons to states such as Wisconsin, Minnesota, North Dakota, Indiana, Ohio, Kentucky, Tennessee, Kansas, Colorado, Nebraska, South Dakota, Nebraska, Missouri, Illinois, Iowa, Michigan, and more. If you have any questions or would like to rent an LED screen, please contact us at baum3@earthlink.net or 844-533-8848.